This is not a real Japanese house. It looks like one. 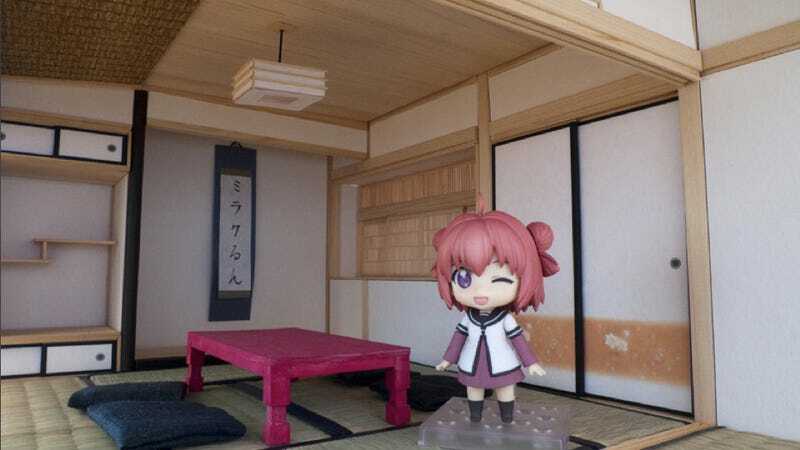 It is, well, a dollhouse—a dollhouse that looks like it's straight out of the Japanese manga and anime YuruYuri. But it's not. Someone made this. That's a small, 100mm figurine of middle schooler Akari, a character from YuruYuri. In the manga and anime, she participates in the "amusement club" with her friends. The dollhouse depicts the group's clubhouse, which is where the tea club used to meet. And this dollhouse is not just a single room, but the entire house. The sliding doors open and close, and it's even possible to remove the walls to take photos of the insides. Even if you don't care about anime, just look at the modeling and woodworking skills on display here.